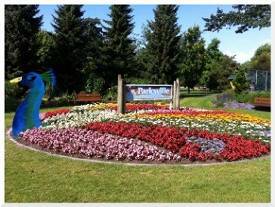 Annual floral displays are featured in several prominent areas of Parksville. Uniquely crafted each year, these elaborate colourful displays reflect the creativity and vibrancy of both our staff and our community. Each year in mid-May, parks staff undertake the formidable task of planting thousands of flowers. 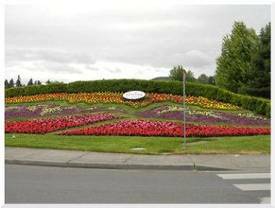 The intersection at Pym Street and Highway 19A is the most prominent display, encompassing about 5,500 individual plants. Other major displays can be seen at the Community Park and the Parksville Civic and Technology Centre on Jensen Avenue East. 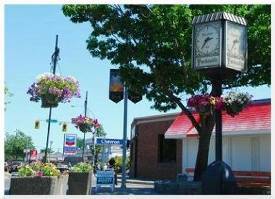 Staff also plant roadside beds and numerous hanging baskets throughout the downtown area and many local businesses also beautify their storefronts with hanging baskets.